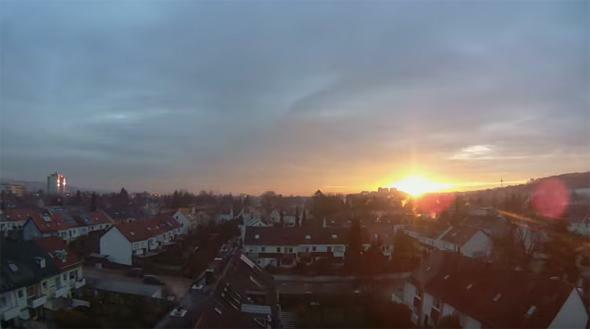 Time-lapse animation of sunrises shows the Sun's motion over the course of a year. Sunrise in Germany near the December solstice, when it rises quite far to the south of east. Oh, I love the Internet sometimes. Last week was the vernal equinox. When I wrote about it, I talked a bit about what it means for the position of the Sun when it sets on the horizon during the year. On the equinoctes (yes, that’s the actual plural of equinox) it sets due west. On the June solstice it sets as far north of west as it can for the year, and on the December solstice it sets as far south as it can for the year. And all this is due to the tilt of the Earth as it orbits the Sun. The thing is, as the “sunset point” moves north and south over the year, it doesn’t always move at the same speed. At the equinoctes it’s moving the fastest, and before the solstices it appears to slow down and stop (solstice means “the Sun stands still”) before reversing direction. For the mathophiles, the motion itself is a sine wave, and the speed it travels is the derivative, a cosine. In my article I lamented that people make time-lapse animations of individual sunsets over the course of a few minutes or an hour, but I’ve never seen a time-lapse showing the position of the Sun changing over the year. I’ve thought about doing it myself, but it’s quite an undertaking. And this is where the magic of the Internet comes in. I got an email from Tobias Hoerburger who did just this! Well, he made a time-lapse of sunrises, not sunsets, but it’s the same idea. He actually has a camera set to take a frame every minute, so he wrote a little bit of code to extract just the sunrises and put them into an animation. That’s great! Yes, it’s cloudy and rains a bit in Germany at sunrise, but you can still see the Sun’s motion. The video starts at the vernal equinox in 2015, on March 21, and runs through to March 20, 2016. The Sun rises due east, then moves left (north) every morning at a rapid rate. You can then see it slow, stop at the June solstice, and then reverse direction, moving south (right). It slows and stops again at the December solstice (note the snow on the rooftops! ), then reverses, moving north again. The weather gets pretty bad, but you can still see enough to get a sense that the Sun moves most rapidly at the equinoctes and most slowly at the solstices, just as I said. I’ve known this was true for a long time, but I’ve never actually seen it shown this way. I’m so glad! Now what we need is for someone in Arizona or some such location to do this, where the weather is more likely to be clear. Or who knows, maybe I’ll still give it a shot. Out here in central Colorado the Sun sets over the mountains, and it’s always magnificent. That should make a pretty good video. And it’s for SCIENCE!